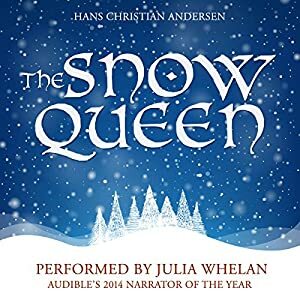 Audible Special Deal For Monday 12/15/14 – The Snow Queen – FREE! This classic tale is a fantastical fable of two dear friends – one of whom goes astray and is literally lost to the north woods, while the other undertakes an epic journey to rescue him. This charming, strange, and wonderful story is a timeless allegory about growing up and the challenges of staying true to one’s self, and it served as the wintry inspiration for the blockbuster hit Frozen. Things Fall Apart tells two intertwining stories, both centering on Okonkwo, a “strong man” of an Ibo village in Nigeria. The first, a powerful fable of the conflict between the individual and society, traces Okonkwo’s fall from grace with the tribal world. The second, as modern as the first is ancient, concerns the clash of cultures and the destruction of Okonkwo’s world with the arrival of European missionaries. You can almost feel the warmth of a campfire as Peter Francis James delivers a passionate reading of Chinua Achebe’s classic African tale about power, prestige, and the Herculian struggle of one man to acquir status in the face of overwhelming odds and one gigantic obstacle after another: droughts, missionaries, poverty, and, most of all, his own powerful Shakespearian demons. Things Fall Apart remains one of the most revered African novels ever written, and James brings an authoritative tone to this 1959 classic. Listening to his booming voice, you understand why he previously narrated portions of The Bible. His rich, baritone voice perfectly suits Achebe’s fable-like prose. James’ melodic voice lulls you into thinking this seemingly simple tale will resolve itself with everyone living happily ever after. Don’t be fooled. This short, incisive book packs a punch you might not see coming right away. The main character, Okonkwo, aspires to be everything his father was not: industrious, serious, successful, respected. But no matter how hard this determined farmer works, fate or the forces of nature seem to conspire against him. Then things become even more complicated when a missionary comes to Okonkwo’s village. The changes seem subtle at first, but slowly the social fabric of the village begins to unravel like a loose strand of yarn in a hand-made sweater. With over eight million copies in print world wide, Achebe’s work is a definitive novel in African literature. 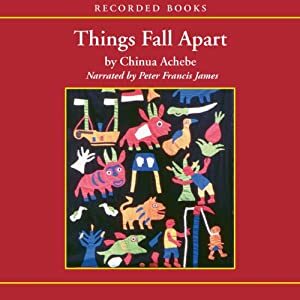 Filled with powerful language and finely drawn characters, Things Fall Apart also shimmers with the sounds and sights of village life. Okonkwo is born into poverty, with a wastrel for a father. Driven by ambition, he works tirelessly to gain the prosperity of many fields and wives, and prestige in his village. But he is harsh as well as diligent. As he sees the traditions of his people eroded by white missionaries and government officials, he lashes out in anger. Things Fall Apart traces the growing friction between village leaders and Europeans determined to save the heathen souls of Africa. But its hero, a noble man who is driven by destructive forces, speaks a universal tongue.